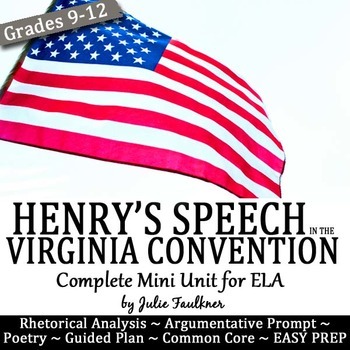 This complete teaching pack for Patrick Henry's exemplar speech "Speech in the Virginia Convention" guides an in-depth study of Henry's speech. With the overarching purpose of analyzing persuasive appeals and examining argumentative writing, this creative and modern pack allows you to cover many standards interestingly and effectively. There are so many options with this low-prep pack that you can pick and choose or work your way through them all. Student Experience: Students will first meet Patrick Henry as they are guided through the background and key events of the time period. 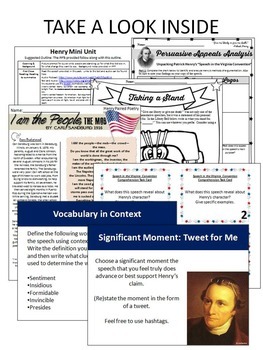 The text can certainly be difficult, but the materials provided will scaffold the vocabulary words, offer an opportunity for summarizing, and guide discussion for breaking down the speech interactively and thoroughly. With advanced students or just to add something different, students will study a paired poem. To assess students' understanding, you can use the short writing prompt at the end. Last, students will complete a creative art project that allows them to make a text-to-self connection with the unit's theme: standing up for what you believe in. 6) Follow up short expository writing prompt. Answers included. Teach your students how to close read and annotate texts in addition to summarizing so they can make the most of their reading experience. My Close Reading and Summarizing Power Pack is a great tool, and it's cost effective! It's Just a Click Away!